Went down to Cabo for a few days and then out on the Solmar V to the Soccoros for a week in mid-January. It can always be a crap shoot, and the last trip I made (this is my third) was in January and was spectacular. This time we had wind and cool weather in Cabo for most of the 5 days before the trip. The islands really had gotten beat up with the hard rain and wind. Fortunately, it had improved as we left. Unfortunately the seas were choppy and the wind was still bad for the first couple of days. The viz, was pretty bad, worst I've seen, normally it's 80-100', but we had more like 20' horizontal and 40' vertical. We couldn't see our fins at Cabo Pearce. Frustratingly, there was pretty decent animal interactions, with lots of hammerheads and even a small Tiger at Canyons, but pretty much impossible to shoot! Roca Partida had a bit better viz, but lumpy seas and strong currents. 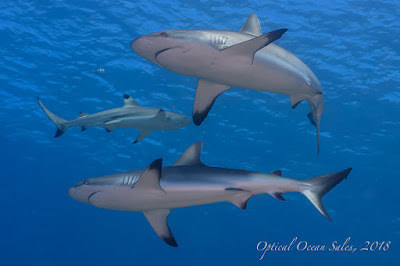 There was a small school of Galapagos sharks, but the group scared them away. Normally it's crystal clear and can have an amazing amount of animals. Finally, we got back to San Benedicto and El Boiler was pretty good, although very hazy, pretty bad in the afternoon. 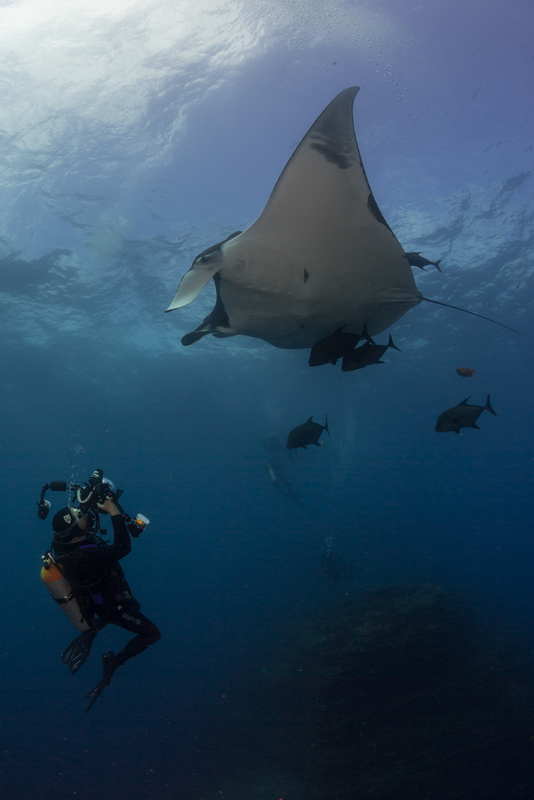 But the mantas were playing and over the course of 8 dives I managed to get some images I liked, by getting within a few feet. Oh well, that's blue water diving for you. The next couple of week's trip reports afterwards had the viz back and conditions excellent. The crew on the Solmar V is fantastic, the old boat still works out quite well, great food, huge camera table and everyone had fun. We do have a charter in 2015 in March concentrating on shooting the humpback whales that migrate there then. I'll have an announcement up soon. Here's a few shots. They were taken with a Nikon D800, Sigma 15mmFE, in a Nauticam NA-D800 housing and Zen 230mm dome port with 2x Sea & Sea YS-D1 strobes. This system is very easy to use underwater as it is neutral and fairly compact for it's capabilities.